After almost seven centuries of near vanishment, letterpress stationery and art has begun experiencing a renaissance of sorts, particularly in the US, Canada and the UK, but surprisingly very little has changed since the first days of letterpress. The original letterpress printing skills used raised metal type cast in individual letters. 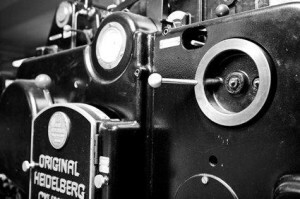 Modern day printers today still use moveable type made from metal or wood. The type was patiently hand-set, locked into a metal frame or chase. Plates are still locked into chases, ink is still mixed by hand, and sheets are fed on and off, one at a time. The presses used in the Victorian period had treads to grasp the paper and were hand-fed to print the sheets one at a time. 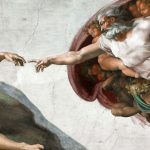 Not much is different since the 1400’s – Johannes Gutenberg would recognize the techniques. Letterpress still involves setting type and motifs in reverse on a press plate. The plate is then inked and pressed onto the surface of the paper. The pressing action transfers the ink and leaves a deep impression on the paper leaving a three dimensional print or indentation. It is highly valued for this unique tactile impression it leaves behind. 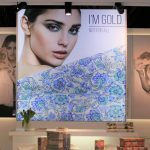 You are drawn to run your fingers across the sheet and feel it– a printing method that cannot be replicated by any other printing process. The nature of the process requires a paper that is high quality…both heavy weight and pliable that will not tear or thin out when pressed. Rossi utilizes a perfect type of papers using fibers that are soft and readily accepts the impression as well as the ink. As one might expect, letterpress printing is both time and labor intensive. Prints are made one at a time with each print having its own unique variations of depth of impression and ink coverage. The process is messy, requiring manual labor and meticulous attention to detail. Letterpress imprints the paper with either type or illustrations and creates a three-dimensional quality. The uneven touch and antique feel of the stamped and pressed paper is what separates letterpress from other printing processes. The look goes straight back to Guttenberg – crisp and tangible. Letterpress transforms paper into art– it changes it from flat to sculptural. And it holds color elegantly, as if the pressed areas are reservoirs of ink. In a world of mass production, creating something that people hold onto is more valuable than ever. Letterpress printing offers that distinction. The entire Rossi Letterpress collection is made with traditional letterpress printing machines. 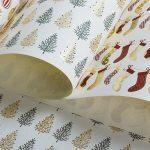 Very few paper makers produce letterpress decorative and wrapping papers, as there are very few machines left in the world. 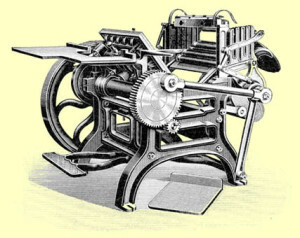 For Rossi’s decorative sheets, big antique letterpresses are used such as the Italian made Nebiolo and the original Heidelberg, (colloquially known in America, although not Europe, as the “Windmill” for its moving arms) Created in pre-war Germany, it was, and remains, the epitome of automated platen press design. The printing principle is the same, but they are a different size. 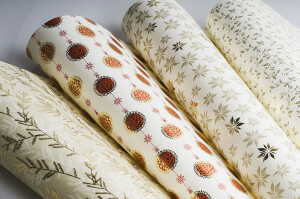 Rossi launched letterpress decorative papers in 2012 with 7 designs, each in 2 colorways for a total of 14 styles with designs that go back to the 15th and 16th century. In 2013 the collection doubled and for 2014 Rossi has added spectacular letterpress Christmas designs with gold foil. The letterpress papers have inspired an extensive stationery and gift item collection; journal covers, notepads, pencil cases, boxes for erasers, soaps, boxes for stationery with both symbols and monograms. We are very proud of our new collection of luggage type gift tags which American consumers have been clamoring for…. Whether found on decorative papers, ornate wedding invitations produced by hip graphic artists, or used for holiday greeting cards, letterpress is catching on with a generation eager for an antidote to the slick, ephemeral quality of modern correspondence. Beautiful, tactile and simply exquisite, letterpress has a rich warm feel that one can’t find in any other printing style.